Four years later, in 1868, his profession was listed as "peintre décorateur" (decorative painter) on his marriage license with Marie-Louise-Chloé Bardet. The young couple were married in Jonzac, another regional town, but subsequently moved to Bordeaux, where Furcy De Lavault made his debut at the regional salon in 1874. Throughout his career, he exhibited most consistently at this annual salon, submitting paintings from 1874 to 1885, then again from 1887-1893. He also exhibited at a number of smaller salons throughout southwestern France, including Pau, La Rochelle, Rochefort, Angoulême and Saintes. Living and working in Bordeaux during the 1870s, Furcy De Lavault initially focused his attention on portraiture. According to the Musées d’art et d’historie in La Rochelle, the artist himself confirmed that he began his career as a portraitist. [iv] Certainly, this would have been a sensible decision for a young painter with a growing family to support. Although most of Furcy De Lavault’s portraits are undated—and often undatable—the rare examples that are range from 1876 to 1896, suggesting that this was a genre that he returned to throughout his career. In the last years of the 1870s, Furcy De Lavault also turned his attention to still life painting, in particular, flower paintings. His interest in this type of genre image may have been prompted by the fascination with Dutch still life paintings within the arts community or perhaps even by the ever-expanding field of botanical knowledge that was emerging from scientific expeditions to the Americas, Africa, and Southeast Asia. 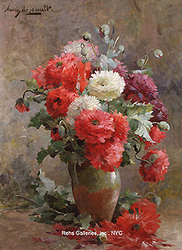 Further, artists such as Henri Biva, Eugène-Henri Cauchois, and Achille-Théodore Cesbron were already in the process of establishing successful careers as flower painters. Furcy De Lavault established himself in Bordeaux and the region before broadening his ambitions to a national stage with his debut at the Paris Salon in 1880 where two of his still life paintings were accepted: Fleurs de Printemps (Spring Flowers) and Nature Morte (Still Life). 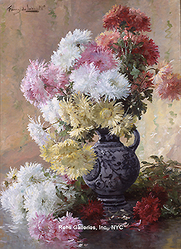 In 1881 he exhibited Fleurs d’Automne (Autumn Flowers) and in 1883, Chrysanthèmes; and in 1888, he received an Honorable Mention for a still life of fruits and flowers. During this decade, he also set his sights on the annual salon at Lyon, where he was represented in 1882, 1886, and from 1889 to 1891. In 1887, he became a member of the Société des Artistes Français. Many of his contemporaries, such as the Impressionist and post-Impressionist group including artists Claude Monet, Pierre-Auguste Renoir, and Paul Cézanne were also interested in still life representation and he was influenced by this group in his treatment and execution of the theme. 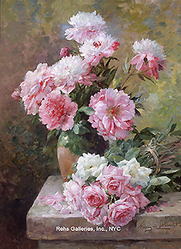 Many other artists also devoted their artistic careers to still life painting including Georges Jeannin, Eugène Claude, Madeleine Lemaire, and Henri Fantin-Latour. Still life painting offered the newly wealthy bourgeoisie an opportunity to demonstrate their cultural sophistication and social status through the display of art; pictures such as those provided by Furcy de Lavault satisfied their desire for a unified and beautiful interior decorating scheme. Furcy De Lavault’s career took a somewhat unexpected turn in early 1882 when he accepted a position as the curator of the Musée de La Rochelle. His candidature was strongly supported by local citizens, as well as members of the Paris art world. He stepped into the job on March 14, 1882, one day after the retirement of his predecessor, Edouard Pinel (1804-1884), a fellow painter from southwestern France. [v] The thirty-five-year-old artist suddenly had a multitude of responsibilities; curatorial work and a corollary position as a professor of drawing as well as his own painting, clients and exhibitions. And while it is true that a curator’s job was less technical and complex in the 1880s than it is today, Furcy De Lavault’s responsibilities certainly increased significantly. Nevertheless, this change in his position did not alter his Salon entries as he continued to exhibit still lifes and flower paintings. 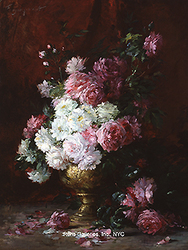 Interestingly enough, while many artists established their careers through successive Salon exhibitions, Furcy de Lavault’s final showing was at the Salon of 1891, where he exhibited a work titled Fleurs. Perhaps he stopped showing at the Salons because he had already attracted enough patrons to sustain his career, or because his curatorial position at the museum took the majority of his time. In light of this, Furcy de Lavault is seen more as an artist who did not focus his entire life on painting. His interests were not exclusively focused on his own canvases, but also included aspects of museum administration and art education. Furcy De Lavault retired from his public duties in April of 1912 at age sixty-five. At that time, he moved from La Rochelle to Clérac, a scant twenty miles from his hometown of Saint-Genis, to be closer to his son Gaston. Throughout his life, Furcy De Lavault remained anchored in his natal region, moving from the very small village where he grew up to the metropolitan centers of Bordeaux and La Rochelle. When he moved to Clérac, he built a new house, which he aptly named “Mon Repos” (My Repose). Albert Tibule Furcy De Lavault died there three years later on February 13, 1915. [i] Aunis is the name given to the traditional province of France in this region. It was conquered by Clovis I (ca. 466-513) in 507 when he defeated the Visigoths in a battle near Poitiers. Clovis I is credited with unifying all of the Frankish tribes into a single nation under his leadership. He was the founder of the Merovingian dynasty which ruled France until 752. For a general reference on this subject, see Edward James, The Origins of France: Clovis to the Capetians, 500–1000 (London: Macmillan, 1982). [iii] Dussol D., La société (Le Salon) des Amis des Arts de Bordeaux (1851-1939), Doctoral thesis, Université Michel Montaigne-Bordeaux III, 1994. (p. 1055.) See also http://www.sudoc.fr/013218174 Special thanks for this reference goes to Freddy Boutrot. [v] Edouard Pinel was widely recognized for his marine paintings, particularly those of the French west coast. He died on May 14, 1884, two years after his retirement from the Musée de La Rochelle. A monographic biography of him was published in 1885. See Alphonse Menut, Edouard Pinel, son oeuvre (La Rochelle: A. Siret, 1885).